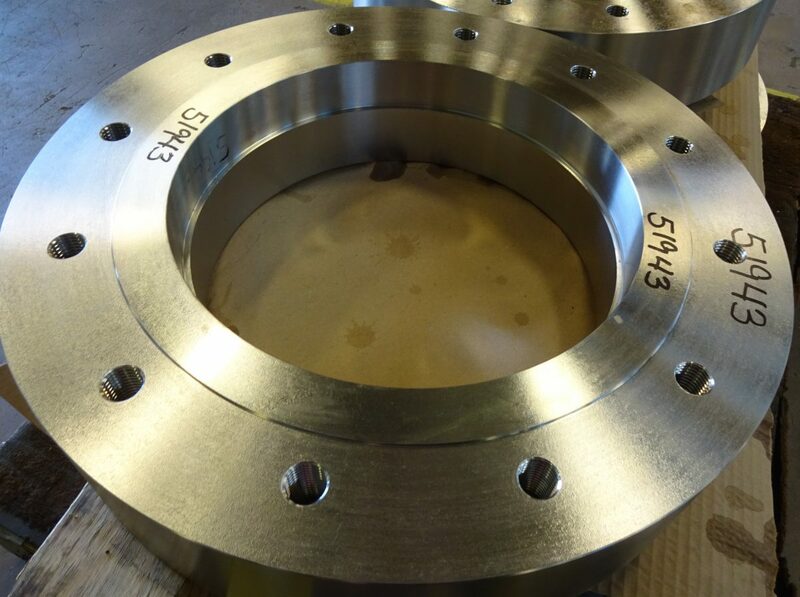 Our customer, a pressure vessel manufacturer, ordered this 19” OD x 10-1/2” ID made of 4-3/8” thick 316L machined all over ring with, raised face, counterbored, drilled and tapped with (16) threaded 7/8” diameter holes 2” deep with a serrated spiral finish. All our products are manufactured to customer specifications from our in-house capabilities. 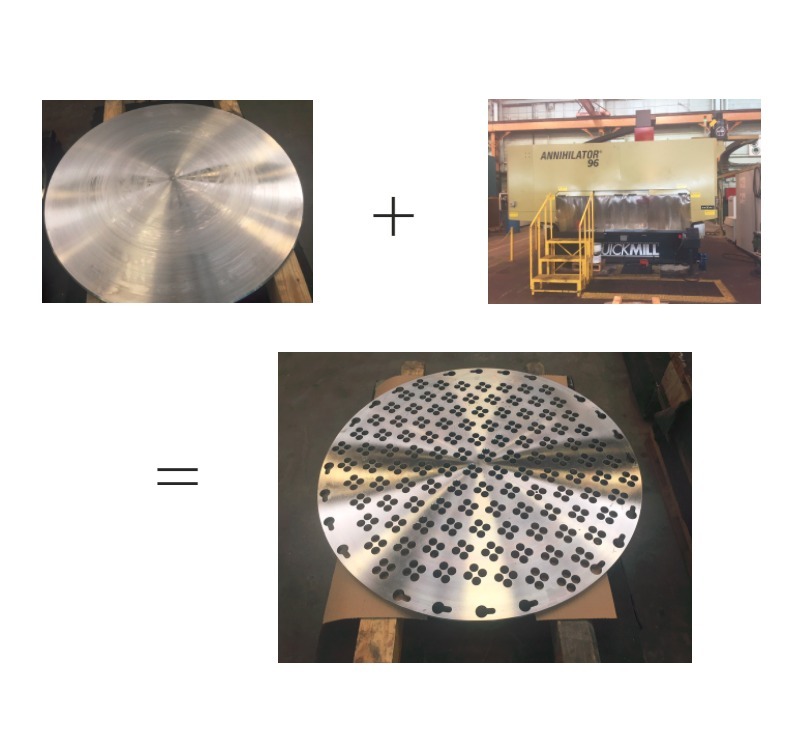 What happens when you take a blank disc of 316L Stainless Steel and run it through our super-fast Quickmill Annihilator machine? This piece that we did recently for a fabricator customer. This unusual shape was drilled quickly and accurately on our Annihilator machine. Sandmeyer is always up for a challenge when it comes to tight timelines and complex shapes! What happens when you take a blank disc of 1” thick 304H Stainless Steel and run it through our super-fast Quickmill Annihilator machine? This piece that we did recently for a customer located in the Midwest. 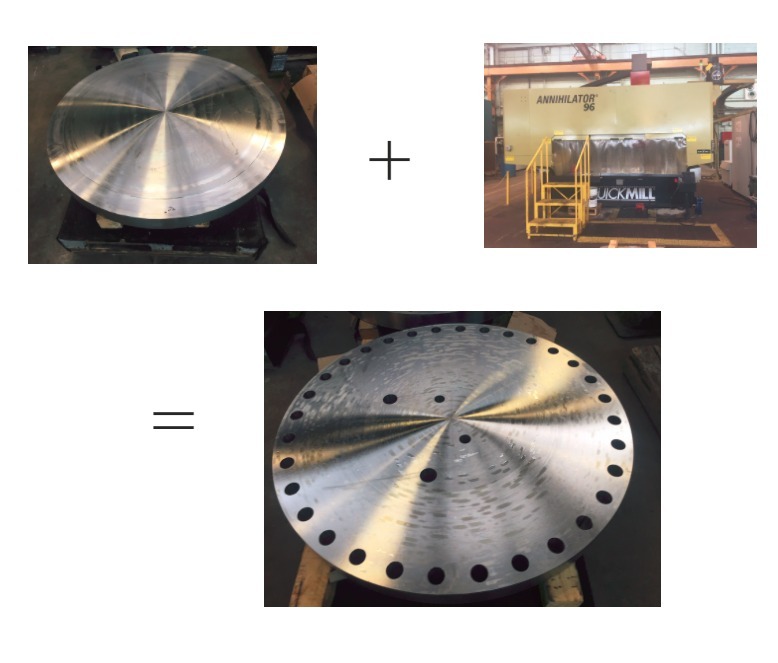 Our Annihilator machine drilled these holes and complex shapes to customer drawing specifications, ensuring an on-time and accurate delivery from Sandmeyer Steel, as always. Robert F. Giles, 86, of Doylestown, Pennsylvania, passed away peacefully with his family by his side Thursday, March 29, 2018. Bob grew up in the McKeesport, Pennsylvania, area graduating from McKeesport High School class of 1950. He joined the Air Force and was eventually stationed at Ft. Dix, New Jersey, where he met the love of his life and future wife, Jackie. They loved to travel with their children, from snorkeling in the Bahamas to an adventure-filled three-week European vacation. Their love of travel continued with many trips to France and Italy, bringing along friends and eventually students from Jackie’s cooking school. Bob loved good food and wine and was the ultimate entertainer. Bob is preceded in death by his wife of nearly 60 years, Jacqualin L. (nee Martin) Giles, his parents James and Virginia Giles, and his grandson Michael Giles. He is survived by his children Jim Giles (Sandy), Jared Giles (Peggy) and Christine Hutkin (Michael), nine grandchildren, his sister Judy Ricciotti, and brother James D. Giles, and several great-grandchildren, nieces, and nephews. Services will be held Saturday, April 7th, at Reed & Steinbach Funeral Home, 2335 Lower State Road, Doylestown, Pennsylvania 18901. Friends may call from 10-11 am with a service to follow at the funeral home. Interment will be at the Washington Crossing National Cemetery at a later date. 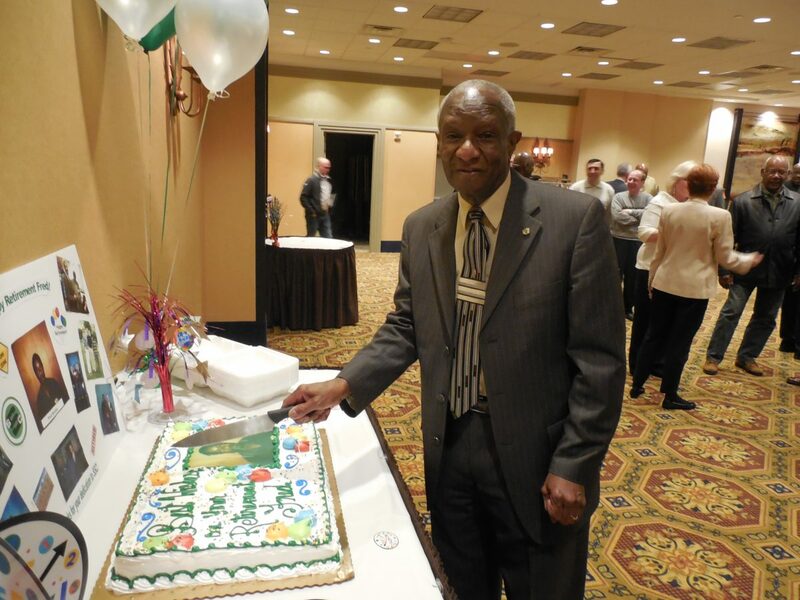 After a total of 47 years of service, Fred Buttler retired from full-time employment here at Sandmeyer Steel. Fred began his career with Sandmeyer in 1970 working in the Machine Shop. To celebrate Fred’s retirement, we held a dinner on Friday, March 23rd. 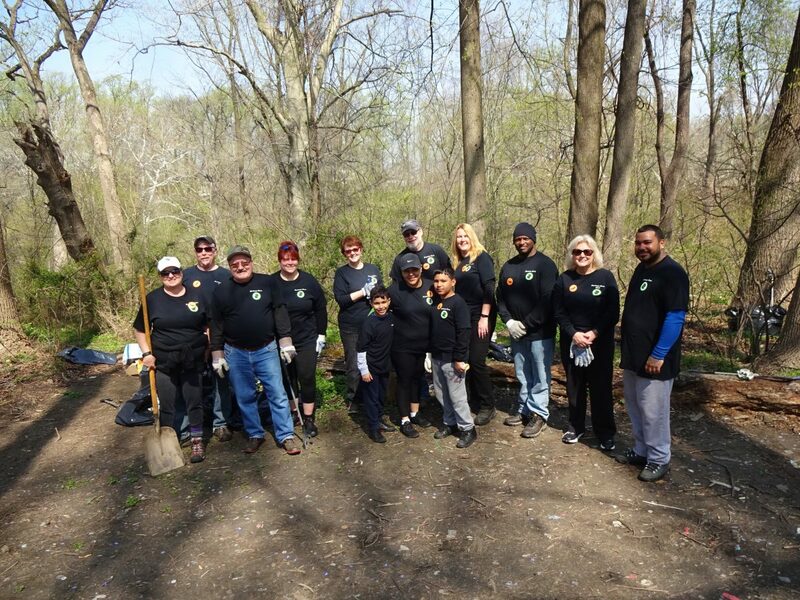 We had a great time congratulating Fred and reminiscing on his time at Sandmeyer Steel Company.